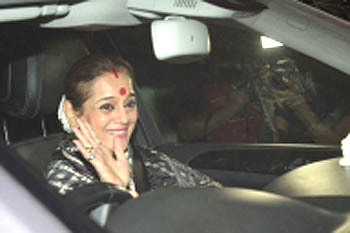 Lucknow, April 4 (IANS) Poonam Sinha, wife of actor-turned-politician Shatrughan Sinha, will be contesting against Union Home Minister Rajnath Singh from the Lucknow parliamentary constituency. According to reliable sources, Poonam Sinha will contest on the Samajwadi Party (SP) ticket with the Bahujan Samaj Party's (BSP) support. Sources said that modalities in this regard were being worked out and it was this that have led to the postponement of Shatrughan Sinha's joining the Congress in Delhi on March 28. "There are four lakh Kayastha voters and 1.3 lakh Sindhi voters in Lucknow, apart from 3.5 lakh Muslims. (Poonam Sinha is a Sindhi while her husband Shatrughan Sinha is a Kayastha). This will give a major push to her candidature," said a SP leader. BJP General Secretary Vijay Pathak, however, dismissed the issue and said, "Lucknow has always been a BJP bastion and continues to be one. Rajnath Singh has ensured a lot of development of the state capital and has a rapport with the people. An imported candidate will not cut much ice with the voters."